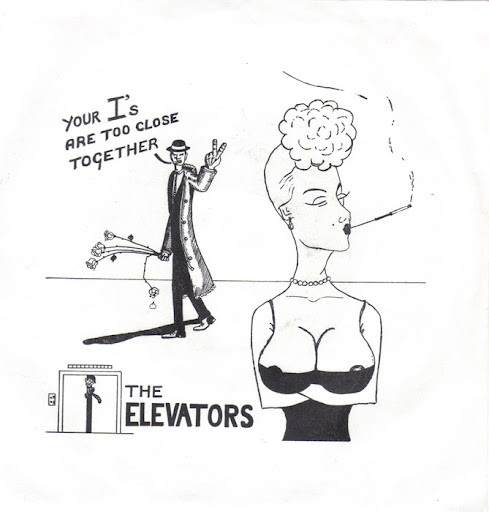 This week Michael has sent me a song called “Your I’s Are Too Close Together” by The Elevators. It’s a song that almost defies analysis because there’s not much to it. “Your I’s…” is a simple skinny-tie song – i.e., very few chords, minimal instrumentation, and simple melodies. I could leave the description at that, but I’m afraid it wouldn’t make for much of a post. Now, I’m a lover of puns, but the one in that title even made me go “Ugh”. The sound of the very first chord that opens the song made me think it was going to be a song from the 1960s. (If all I ever heard of this song was the first three seconds, I’d swear it was from the 60s.) But then the singin’ chappy started a-singin’ and it sounded skinny-tie-ish, placing it squarely in 1980. I was a bit surprised with the singin’ chappy’s singing in the first part of the song, because I didn’t think he was going to sing the same melody over and over again for twenty seconds*. Until the singer changed his melody at 0:24 I was afraid he was going to do nothing but sing that initial tune for the entire song. That Pete Townshend song was released in the same year as the Elevators one. Hmm. Oh, before I forget: I want to mention that the singer reminds me of Pete Shelley (from the Buzzcocks) . I was a bit irritated that it took 45 seconds to get to the chorus. I thought skinny tie songs were meant to be zippy and to-the-point, no messin’ about (like punk, which is where I thought skinny-tie power pop came from). But anyway, at 0:45 it became the chorus. Oh-oh: the melody of the chorus reminds me of something. And the melody in the second half of the chorus (“Your ey-ey-ey-ey-eys…” starting at 0:58) also reminds me of something, too. This isn’t helping me concentrate on the song at hand. I was surprised when he sang the “Your ey-ey-ey-ey-eys…” three times. I thought that was two times too many (i.e., once was enough). And the melody after that, “to-ge-ther” starting at 1:08, was repeated far too many times for my liking. I counted, and he sang “to-ge-ther” four times – but it felt like many more. I must say that, for a skinny-tie song, I’m a bit dismayed at how much repetition is going on in this supposedly short’n’sweet early-80’s power pop ditty. The chorus has finished, and it’s on to the second verse with an alarming repetition of the initial melody. And then it’s the chorus with its three melodies repeated ad nauseum. But at least the song finished fading out on the second chorus. There really wasn’t much to this song.